Thank you Bob’s Red Mill for sponsoring this post. Create a care package for a loved one today and don’t forget to include some baked goods made with Bob’s Red Mill products! Is there someone in your life you really admire and perhaps want to show you care? For me that someone is my mom. My mom is a hard working special education elementary school teacher in NYC. She wakes up at 4:30 am every day to make sure she beats that never-ending New York traffic in order to get to school on time. She absolutely loves teaching and loves her students. And she’s that type of teacher that still gets emails, calls, and visits from students of years gone by. After listening to all the stories and all the ups and downs she’s had as being a teacher, one thing never changes. Her love for the children she teaches and her willingness to face and surpass the many challenges they bring. You see when you’re a good teacher you’re not just a teacher. You’re also a psychologist, social worker, parent, disciplinarian, mentor, and friend. It can be greatly rewarding, but also emotionally draining. Yet not everyone recognizes or appreciates this. 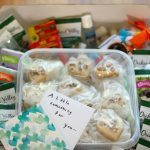 We live about 3 hours apart so I thought a care package would help her start the new school year off on a nice note. A sweet and tasty note to let her know I understand and care. 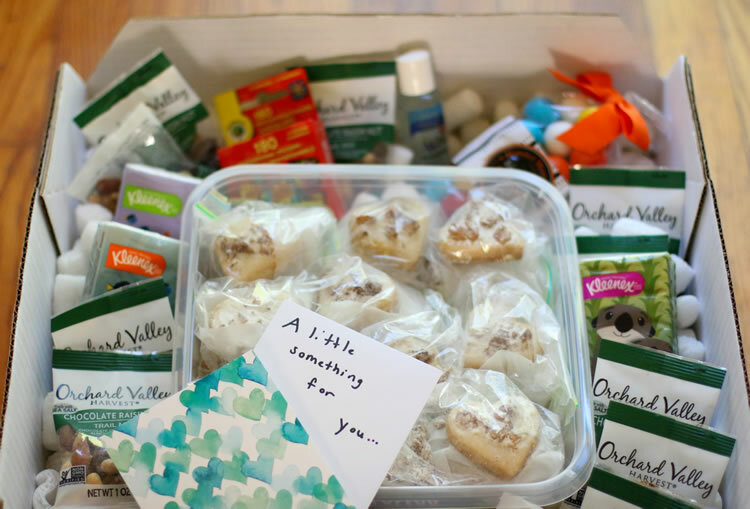 If you’ve never made a care package before it’s easy, fun and rewarding. And did you know psychologists have found that baking for others can make you feel as good as the recipient? Baking = happiness. Are they a relative, old friend or simply someone you want to cheer up? Use this as a starting off point when thinking of ideas for what you’d like to put in your box. Maybe they could use something for their desk at work, car or nightstand at home. Do they like sweet or salty things? What do they love? Is there anything they could really use that would make their day easier? Is there something they can really use? My mom is a teacher with a sweet tooth and I know sometimes she is so busy during the day that she sometimes has to skip lunch. I decided to bake her some of her favorite cookies while including some things she can snack on during the day. I also included some adorable motivational stickers for her students, some tissues, antibacterial gel, and gumballs because well, she loves gumballs. Crazy For Cookies: Bake up a few types of cookies and package them up. Spa Night: Include items like relaxing bath products, teas, a candle and manicure set. Movie Night: Who doesn’t love movie night? Include some prepaid movie tickets or a DVD and movie snacks. Book Lover: Pick a topic, genre or favorite author. Also, include their favorite coffee blend and baked good. Get Well Soon: Pack up some local honey, soothing tea blends, magazines, dried soup blends, cold medicine and lip balm. Whatever you’re sending make sure you have a strong, sturdy box that can fit everything you would like to include in your care package. You want it to be able to withstand the stresses of shipping. If sending cookies or baked goods (always a crowd favorite) make sure you have protective packaging like bubble wrap or shredded paper to prevent movement. When it comes to shipping baked goods shaking=breaking. and can seal them airtight in case of longer than expected transit times. Basically, you’ll want to put your baked goods box within your shipping box. Tins work well as do resealable plastic containers. Cookies should be gently packed snuggly with parchment or wax paper dividing them to prevent sticking. For my care package, I packed 3 cookies divided with parchment, in each resealable plastic baggies. I then placed those in the resealable plastic container until it was full. Not only is it airtight, but it will prevent shifting and my mom can reuse it in her classroom to store things. Leftover peanuts I had saved lined the inside of shipping box. Your local dollar store is always a great place to find these types of care package supplies. Make sure the person receiving the care package knows why you’re sending them the package. Include a sweet little note card. You can even write messages, famous quotes or funny jokes on the inside of the box. All you need for shortbread cookies is butter, confectioners sugar, vanilla or extract of choice, a little salt and a really great quality flour. I used Bob’s Red Mill’s Organic All Purpose Flour, which I love for all sorts of baked treats. 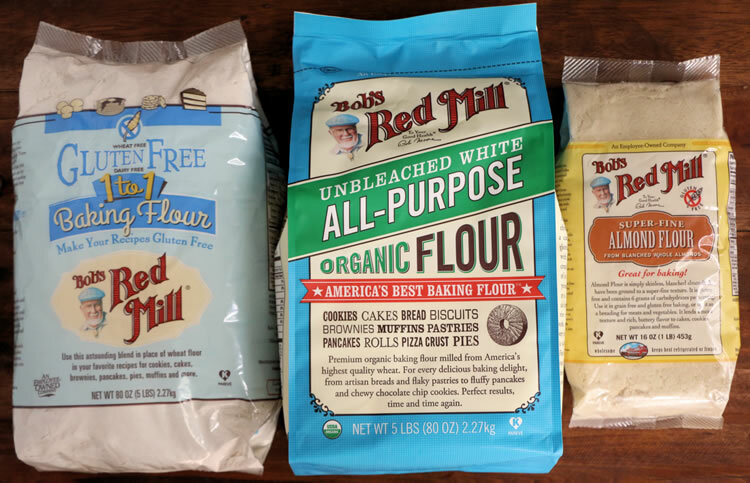 If you’re baking for someone that is gluten-free or adheres to a specific diet, Bob’s Red Mill also has flours like a gluten-free all-purpose flour and a finely milled almond flour for that. In fact, they have flours for just about everything. You don’t want to compromise on quality when you bake! It will definitely show through in your end result. To make the shortbread cookies I began by adding butter and confectionery sugar to my mixing bowl and creamed until whipped and fluffy. You may have to scrape down the sides a few times. Add the vanilla and whip again until incorporated. Once the butter, sugar, and vanilla are creamed add the flour slowly with the mixer on the lowest setting. Otherwise, you’ll have a mini flour explosion. I speak from experience. You don’t need that in your life. I like to roll out the dough to about a half inch thickness. You can make them the thickness you prefer. Thicker and you’ll get fewer cookies per batch and thinner and few more. Using a 2 inch by 2-inch heart cookie cutter this recipe yielded 32 shortbread cookies. Your yield will depend on the cookie cutter you use as well as the thickness of the dough. 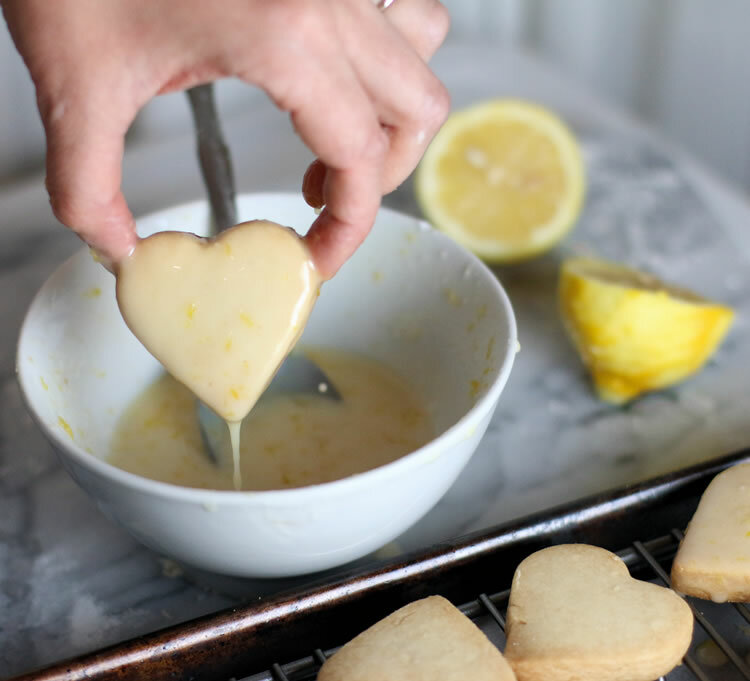 The lemon cookie glaze is simply confectioners sugar, lemon juice, and lemon zest. The glaze should be the consistency of very thin yogurt. You don’t need much juice as the sugar quickly melts into it. Add too much and you’ll find yourself adding more and more sugar get the right consistency. It’s okay though. If you have too much glaze just make more cookies. It also does well in the fridge for a few days and the flavor intensifies. Perfect for sweetening cocktails. That’s for another day though… Or is it? I like to make the lemon glaze and let it sit at room temperature while the dough is chilling. This way you won’t have to worry about straining out sugar lumps. They just eventually melt into the glaze on their own. Just give it a nice good stir before you dip. I usually do 2 rounds of dipping the cookies and let them drip onto parchment paper over a baking sheet for easy cleanup. 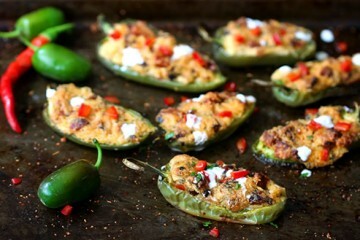 You can then sprinkle them with the pecans, nuts of choice or none at all. Try drizzling a little more glaze over the nuts for a candied effect. Delicious! I wrapped the cookies for shipping by taking small squares of parchment paper and layering it in between stacks of 3 cookies. Three cookies was how deep my solid container was so that’s what I went with. I then placed that stack of 3 cookies into a plastic zip baggie while forcing all the air out before sealing. I then placed those cookies into the plastic container I found at the dollar store. Before shipping, I’ll put the lid on and give it a good shake. If it feels like it’s shifting inside at all I’ll add some parchment paper for a snug fit. I layered the box with leftover peanuts I saved from a package I previously got. Arranged the goodies around the edge of the box. I’ll then put the lid on the cookie tub and add more peanuts for extra protection. The box lid will go on and I’ll send it out using Priority Mail as shorter shipping times are best. You can check out our shortbread recipe below. 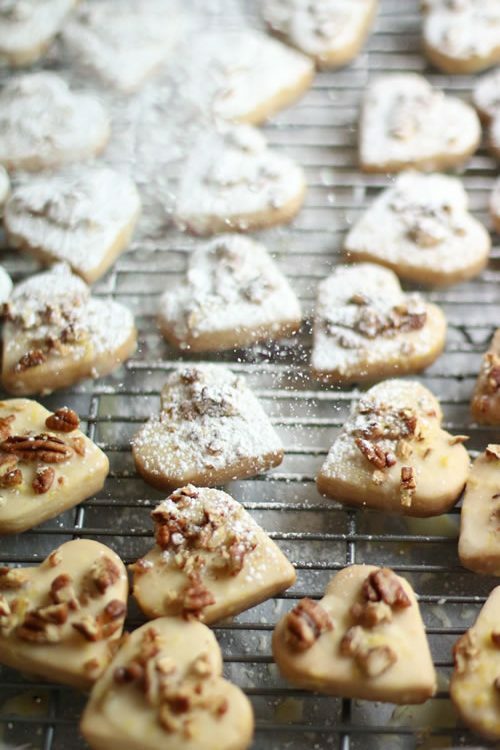 If you're looking for an easy cookie recipe to bake that tastes amazing and holds up wonderfully in the mail look no further than this Pecan + Lemon Glazed Shortbread recipe. This buttery shortbread cookie is dipped in a lemony glaze and then sprinkled with toasted pecans. 1 - Place the flour and salt in a bowl. Stir to combine and then set aside. 2 - Put the butter and confectionary sugar in an electric mixer fitted with a paddle attachment. Cream the butter and sugar together until completely blended on medium speed. The butter should look whipped. Turn off the mixer, scrape down the sides, add the vanilla extract and then blend on high speed for 20 more seconds. 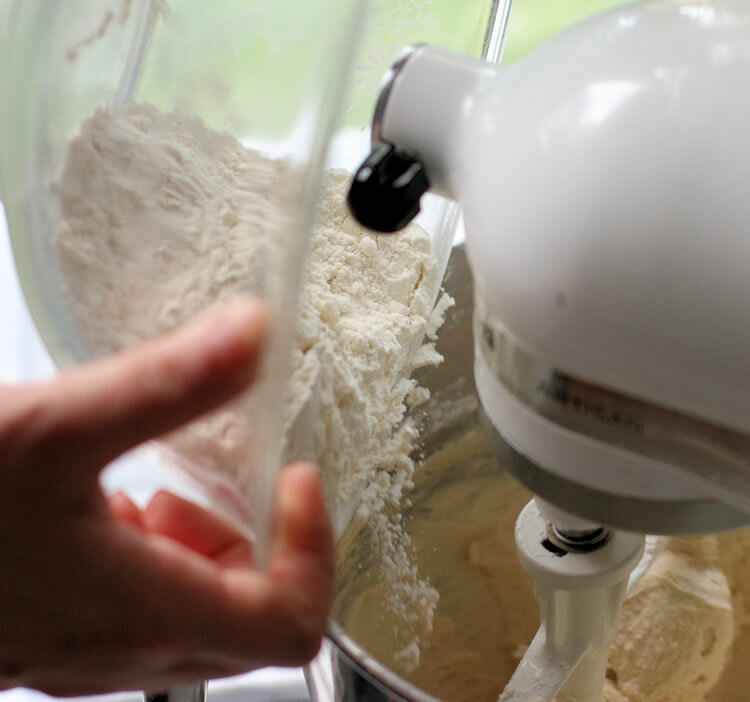 3 - With your mixer on low, begin adding the dry ingredients (flour + salt) slowly about a half a cup at a time. Scrape the sides down with a spatula and mix again to ensure all the butter is incorporated evenly into the flour. Shortbread dough should not be very sticky. If this is the case, add a few more tablespoons of flour until you can form the dough into a ball. Wrap in plastic and chill in the refrigerator for 15 minutes. 4 - While the dough is chilling prepare the lemon glaze. 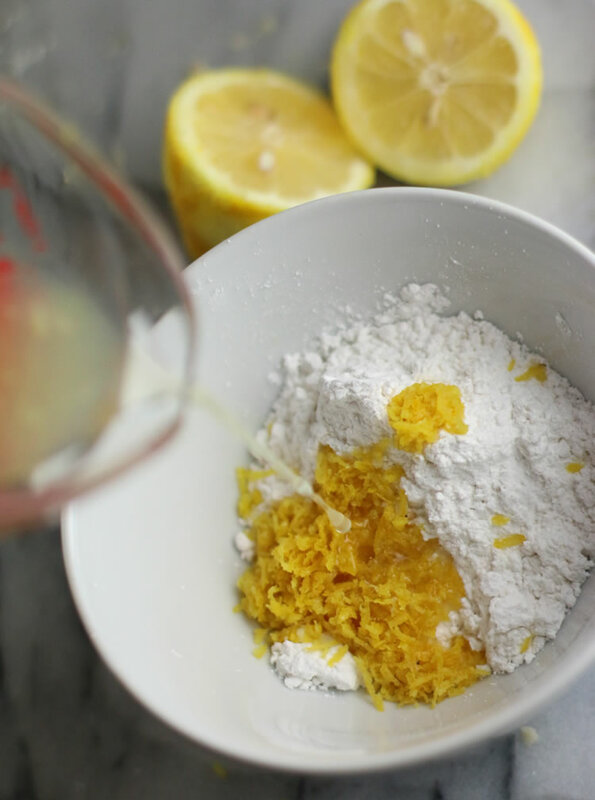 In a small bowl whisk together the lemon zest, confectioners sugar, and fresh lemon juice and let stand at room temperature. If you notice lumps from the sugar, don't worry! 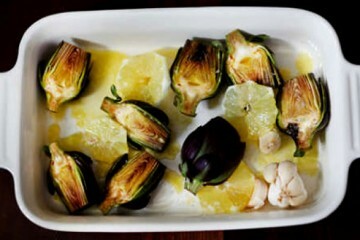 These will incorporate into the glaze after 20 minutes or so. 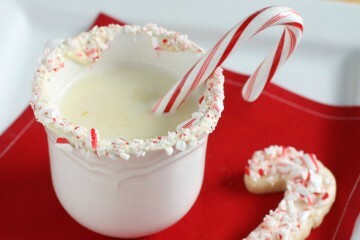 Just give the glaze a good stir before you start dipping the cookies and the lumps should be all gone. 5- Preheat your oven to 325 degrees Fahrenheit. Line 2 baking sheets with parchment paper. If you don't have parchment paper no worries and just have the baking sheets ready. No need to grease. 6. Remove the dough ball from the refrigerator. 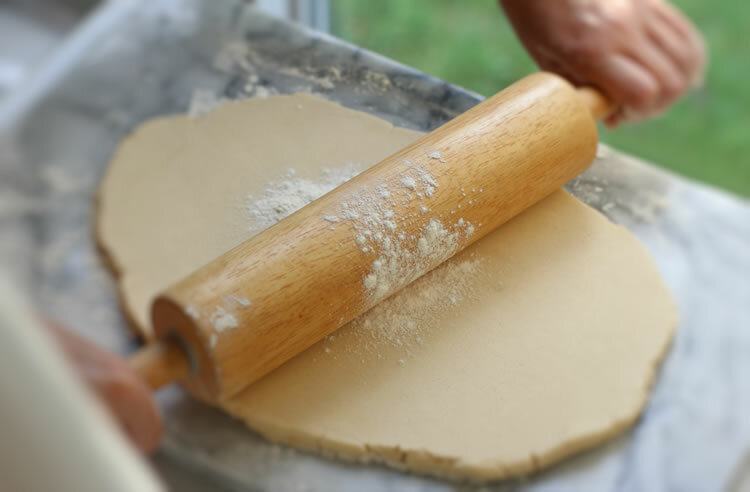 Roll out the dough on a floured surface to about a 1/2 inch thickness. Using a cookie cutter of your choice cut out the shapes from the dough and move to the baking sheet. Once all the cookies are cut place in the refrigerator to cool for about 15 to 20 minutes. They should be hard to the touch so they hold their form. 7- Bake for 25 minutes or until you see a light toasted brown color on the edges. Transfer the cookies to a cooling rack. Once cool, dip the cookies in the lemon glaze and let dry on the rack. You should have enough glaze to do this twice to give the cookies a nice layer of lemon glaze. Sprinkle with the pecans (if using) and then let the cookies dry for 2 hours. 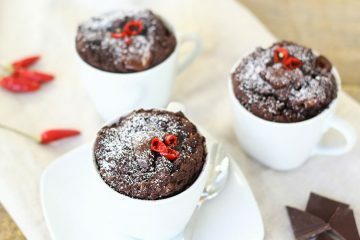 8-Before serving or packaging, sprinkle with confectioners sugar. These cookies get better after a day or two and can last a month or more in a tightly sealed container that is stored at room temperature. Refrigeration will make them last even longer. <<< 🎁 Have you ever made a care package before??? Share with us in the comments who you made it for and what you thought to include. 👉 If you’re looking to make a care package for someone special Bob’s Red Mill wants to help! 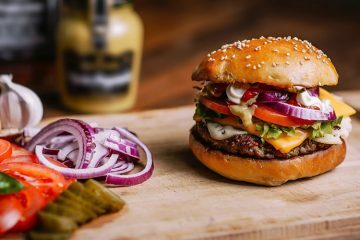 Click the link here –> to visit Bob’s Red Mill for more recipes and ideas. Want a coupon? Sure you do! 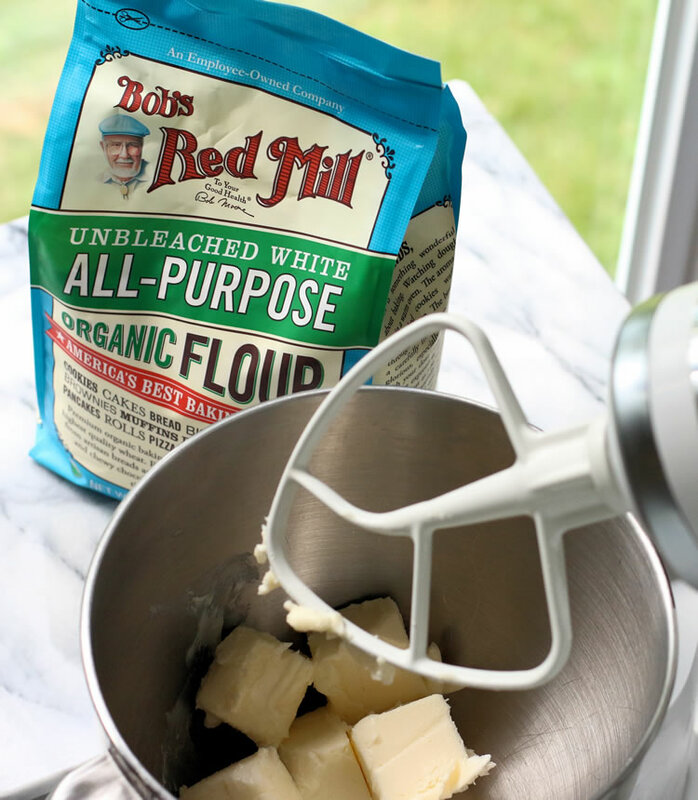 Click the link here –> for $1 off any Bob’s Red Mill flour!